First celebrated in 1908, when Anna Jarvis held a memorial for her own mother in Grafton, West Virginia, the celebration of Mother’s Day quickly became a movement. Jarvis chose a Sunday because she wanted it to be a “holy” day, not a holiday, and the second Sunday in May because it was the anniversary of her mother’s death. Jarvis trademarked the phrases “second Sunday in May” and “Mother’s Day,” and created the Mother’s Day International Association. She was specific about the location of the apostrophe; it was to be a singular possessive, for each family to honour their mother, not a plural possessive commemorating all mothers in the world. The mass commercialization of the day that followed was not part of Jarvis’s vision for the day. Greeting card companies and florists seized upon the glaring opportunity. The ‘holy day’ quickly became a retailing and marketing bonanza! Jarvis was disheartened at the misinterpretation and exploitation of the day that she protested and even tried to rescind Mother’s Day. Her goal was to continue and honour the work of her mother, a peace activist and social worker, who as early as the 1850s, held ‘Mother’s Day’ work clubs to improve sanitary conditions and worked to lower the infant mortality rate by fighting disease and curbing milk contamination. Jarvis’s also mother cared for wounded soldiers on both sides of the Civil War. Whilst the symbol of the white carnation became entrenched in the celebrations across America, the flower traditionally given to mothers on this day in Australia is the humble chrysanthemum, as it is naturally in season during May (autumn in Australia) and some say because the name ends in “mum”, a common affectionate shortening of “mother”! Jarvis spent her considerable inheritance and the rest of her life fighting the commercialization of “her” holiday but it was a losing battle. 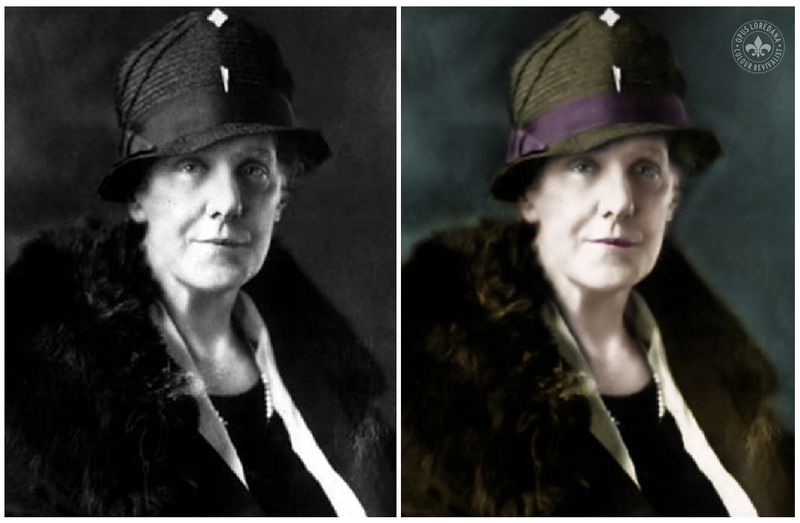 Anna Jarvis died in 1948, at the age of 84, bitter, with dementia and completely penniless in a Philadelphia’s Marshall Square Sanitarium. Today I leave you with this wonderful tribute to Mother’s Day performed by a very young Ricky Martin and a not so old Luciano Pavarotti. This entry was posted in Colorization, Colourisation, History, Mother & Child, Opus Loredana, Photography, USA, Women and tagged Loredana Crupi, Luciano Pavarotti, Mother's Day, Opus Loredana, Ricky Martin. Bookmark the permalink. ahha you’re back to it 🙂 we have had our Mother’s day a few weeks ago here, I didn’t know this was the start of it, we used to call it Mothering Sunday, but think thats something to do with the church. Nice colouring, she sounds a formidable lady. Hard to break old habits! 🙂 What part of the world are you in Fraggle?